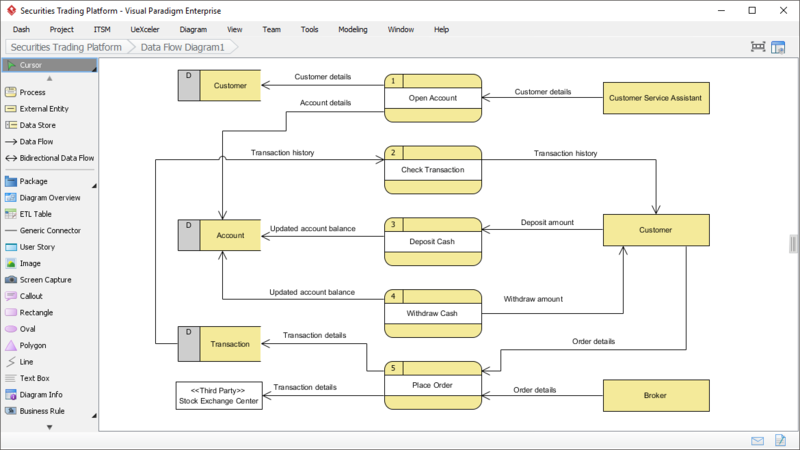 Create data flow diagram (DFD) for your presentations and reports, with a powerful DFD tool. Data Flow Diagram (DFD) provides a visual representation of how information flow within a system. 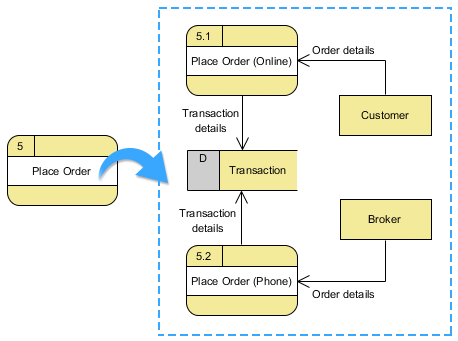 With DFD, you can identify the information provided by and output to certain entity or sub-process within a specific system/process scope, the kind and form of information needed in order to complete the process. Create DFD quickly and easily with Visual Paradigm. We features a large number of editing and modeling features that make modeling simple - drag and drop shape creation, precise shape positioning with alignment guide, element reusability, and more! Manage DFDs in multiple context levels. Use the Decompose function to easily create a new sub-process level of a DFD, with the associated entities and data stores automatically brought to lower level to maintain model integrity. Enjoy quick and smooth navigation between process levels with the help of breadcrumb.